In Austin, Texas, they don’t mess around with lawbreakers. And a gun wielding thug trying to rob a smoke shop found that out the hard way. 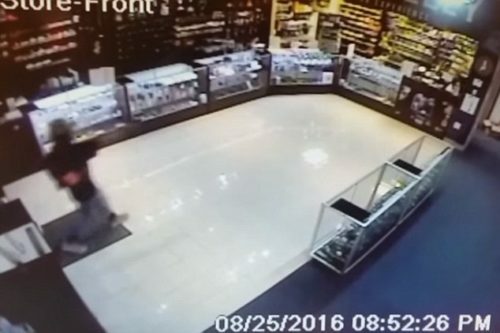 Surveillance video shows the criminal entering the store with gun drawn. What he wasn’t prepared for was the store clerk, who was packing his own firearm and immediately began firing at the intruder. The clerk had a CZ-75 SP-01 9mm pistol. And the armed would-be thief ran away into the street as bullets shattered the glass doors behind him. After checking to see if the thug was gone, the clerk strolled back in and finished his cigarette, which he had been smoking the entire time. That is one cool dude. Don’t mess with Texas…or with a store clerk who’s packing. See video below.